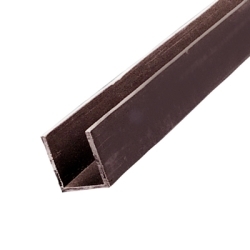 2.51" W x 1.456" H x .080" Wall PVC Channel | U.S. Plastic Corp. This PVC channel is sold in 10' sections only. The tolerance-length: +/- 1". Tolerances on all other dimensions is +/- 10%. The color is dark gray.